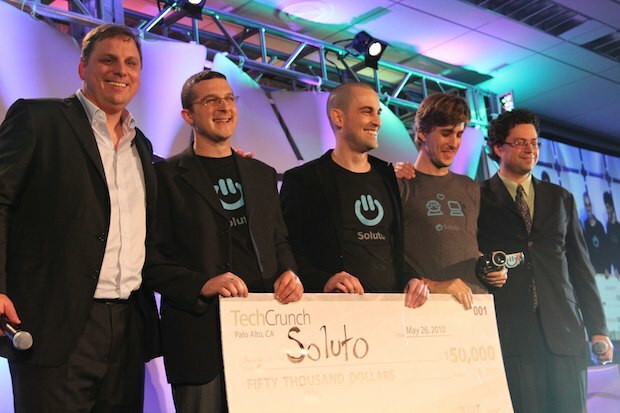 Two days after launching the beta version of their first product, Soluto was anointed the winner of the hyper competitive start-up battle at TechCrunch Disrupt yesterday in New York. This is a prestigious accolade and an ideal launch pad especially for a company like Soluto which needs a large user base to perfect its product. To be clear, this was not any start-up competition, or simply the latest crop of Web start-ups, but Web start-ups that have the potential to be disruptive. I know it’s a loaded word that many will contest until they are blue in the face, but simply adding this modifier, made this more interesting and challenging than usual. I applaud TechCrunch for putting on the event, and am thrilled that my own portfolio company would take home the victory cup. So congratulations to Tomer, Ishay, Roee and the rest of the hard working Soluto team! And for those of you who don’t already know, Soluto is developing anti-frustration software. This download and accompanying service aims to lessen, if not eliminate, the frustration PC users feel when they twiddle their thumbs waiting for their computer to boot, staring at a frozen mouse cursor or rotating hourglass, or screaming in anguish when an application suddenly crashes on them. I invested in Soluto foremost because of the strong entrepreneurs, who exhibit that rare combination technology depth and aptitude for consumer products. However, beyond the team and market potential, Soluto had a particular resonance with me because of their vision and approach. It fit squarely with my own investment roadmap around companies that leverage technology and their user base to create innovative web-based services for consumers. My favorite motif within this “technology-enabled, crowd source-enhanced web service” investment roadmap of mine is that of Big Data-based services. Big Data simply refers to incredibly large data sets that are too cumbersome to accumulate let alone work with and make sense of. I am not so much interested in the companies developing infrastructure solutions to manage data, but rather companies that are developing new products services based on their ability to capture big data, synthesize and analyze it, and package it into a simple, yet valuable consumer products and services. Initially, the appeal lies with the fact that very often the data already exists, but is buried or otherwise inaccessible. Secondly, I am attracted by the idea that the product will strengthen with more use and over time creating a naturally widening lead over any aspiring competition(large or small). I am increasingly of the opinion that to be successful, in particularly out of Israel, web start-ups must either leverage strong technology and/or the power of the crowd to maintain a competitive advantage in the face of so much competition for customers and investment dollars. All of this is far from trivial, but Soluto aims to do just this. They start with a powerful, yet very intuitive download, which serves a dual purpose of providing a free boot utility to consumers, while capturing important data anonymously, not unlike anti-virus software. This “passive” crowd sourcing is valuable because Soluto has already built the backend of their service which knows how to make sense of the data for the creation of the second order product, which is the anti-frustration service. There is also “active” crowd sourcing through the techie users who can easily contribute their knowledge and solutions to the product. With a more than a billion PCs in use, most of them frustrated, the business opportunity is enormous. The intense demand explains the relative success of snake oil solutions like registry cleaners or extreme methods like repetitive reimaging. And as anti-virus increasingly becomes a commodity or outright free, anti-frustration software pioneered by Soluto, may be its natural successor. Even though it is still early days at Soluto, I continue to look for more companies that pursue similar strategies. In fact, I hope to announce my next “technology-enabled, crowd source-enhanced” web service investment soon. In the meantime, download and install Soluto! Congratulations to you and to Soluto for a job well done at the NY TechCrunch Disrupt 2010 in NYC. there very simple solution at reimage that resolve this problem with huge success. there very simple solution at http://reimage.com that resolve this problem with huge success. Whatever were you thinking when you invested in Intucell? You invested more money than the gross revenues that the company will realize in the next 10 years. The technology is easily duplicated and, in any case, is mostly irrelevant to cellular operators. And now, you have turned your back as the CEO has hired in his brother. Keep your eyes on the company's bank account. These two have a history.